#1.1 7 Best Cannon Gun Safes on the Market! #1.2 Why Choose Cannon for Your Next Gun Safe? If you have firearms, then you know it is absolutely imperative that you do all that you can to keep them secure. Far too many accidents occur in a person’s home or business because a child or a person who is not very responsible has gotten their hands on the gun, causing injury or even death. This is why owning a safe is absolutely essential, but you also want something that is more than just a gun safe. You want to be able to protect all your valuables, and to organize them in a way that makes accessibility easy. Plus, you want to know that the safe you are buying is going to keep your items secure. This is why many have turned to the Cannon safe as their option. 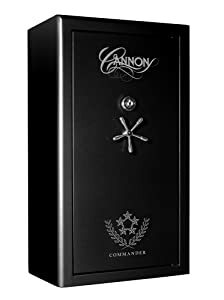 7 Best Cannon Gun Safes on the Market! While you can have confidence in any Cannon safe that you purchase, you may have specific needs where one model is better than another. If you are looking for the best safe option for your home or business, here are seven you want to take a close look at. Cannon has been known for creating outstanding safes, and this is one you are truly going to come to appreciate. It starts with the fact that you are able to store up to 36 guns in this large device, yet still have room for a large number of accessories, including ammunition, magazines, jewelry, and the like. What you will like about this safe is that its roominess affords you the opportunity to modify the safe to fit your needs. If you need a lot of shelving to better organize the inside of your safe, this is the perfect option for you. Not only would you have plenty of room for rifles and handguns, but still have a large amount of space for other kinds of accessories. The very top of this safe has a fixed shelf but, after that, you can modify it to fit your needs. As one of the things you will truly come to love about the design and construction of the safe. The door contains pistol holders and there are additional pockets for you to place such items as passports or other gear. There are even hooks for your key rings. Of course, you want a safe because it protects the things that are valuable to you, and this is where you will come to love this safe. It starts with the fact that it provides up to 90 minutes of protection in case of fire. Most standard fires are out within 10 to 15 minutes of the fire department being called, so you will have plenty of time before you have to worry about your valuable items being damaged. This safe uses a 10 gauge steel and is designed with 12 deadbolt locks to securely hold the door in place. The hinges are pry proof, and the metal used makes it so that someone is not able to drill their way through. This is truly a fantastic option that uses a high-security EMP lock, you will definitely have a lot of confidence that your items are protected in this safe. This is another great option from Cannon. Because of its design, it is able to hold up to 48 guns and still give you some room for accessories and documents. The safe is designed with a triple hard plate giving you optimal protection against those who would attempt to break into your product. There are 4 inch locking bolts that securely hold the door in place, making it virtually pry resistant and it is resistant to impact and drilling because of the heavy thickness of the plates used. You can be sure you’re getting a lot of protection here. This safe is designed to protect your valuables in case of a fire. It provides up to 60 minutes of protection and provides a triple fin intumescent seal which helps protect your valuables from smoke. This should be plenty of time to protect the things that mean the most to you from flames and heat. You are able to customize this safe as well. While you are able to store up to 48 guns inside the safe, it is specifically designed to give you the ability to customize the interior to accommodate what you need to store. This includes two large pouches in the door, as well as holster spots for pistols. Shelving is included for you to be able to adjust for his many as a few rifles all the way up to dozens. In addition, the safe provides you with a data and electrical connector. The data feed allows you to access into your wireless network, informing you of any changes to the safe. Messages are sent to your smart phone to inform you about attempts to get into the safe, adding additional protection. This is a sharp looking safe which is well designed to protect the things that matter to you most. This is a safe that can hold up to 42 guns, of course that depends upon the type and the types of accessories that you are also including inside your safe. Fortunately, the bottom portion of the safe allows you to be able to customize it to include such things as a rifle rack or shelves, so that you are able to easily store your rifles, pistols, ammunition, magazines, and other valuable items. The door contains pockets that not only allow you to be able to holster your pistols, but also to hold important documents. It’s perfect for you to attach keys, store your passports, and even place jewelry, such as necklaces and bracelets. The fact that you are able to customize the cabinet, even do so in the door to some degree, makes this an ideal choice. 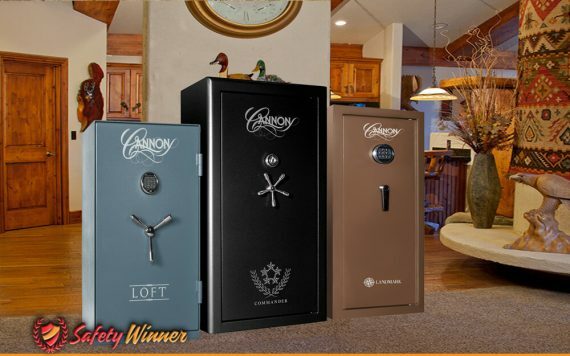 This Cannon safe is made of a 14 gauge steel, and contains four 4” locking bolts, giving you a great deal of confidence that your valuables are going to be Safe. This safe is made to be both impact resistant, drill and pry resistant so you can have a great deal of confidence in the security of this product. The safe provides up to 45 minutes of protection from fire. Plus, you can be confident in protecting the contents from smoke. It is a well designed safe that will give you all the protection you could possibly ask for. The safe uses an EMP lock that is easy for you to program on your own. The digital lock needs batteries to run, but you do not have to worry about a cord creating vulnerability with your safe. You can also use the mechanical lock option if you so desire. A great choice for sure. Why Choose Cannon for Your Next Gun Safe? Most of the safes that they have to offer come with lifetime guarantees. 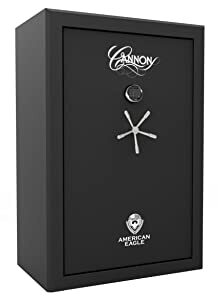 This tells you that the maker stands behind their product, and Cannon has built a reputation of dependability, giving you confidence that the safe you are buying is one that will protect your valuables. Gun safe is no good if it doesn’t protect its contents, but Cannon build quality products that you know you can depend upon. They use heavy gauge steel, and you will love their patented tru-lock technology which prevents a person from being able to pry open the safe door. Cannon safes are known for the incredible way that they product your valuables should you have a fire. Not only do you get top ratings but also long lasting protection as most of their safes can withstand the heat of a fire for at least 60 minutes. We live in a technological world, and Cannon has joined the wave. This means that you can purchase safes that, with phone apps that notify you when the safe has been opened or if someone is attempting to open it. Besides providing you with the protection you need for your valuables, these are attractive looking safes. This means that if you wish to stick them in your office or den, you can be sure that they are not an eyesore. Why Choose Combination Lock Gun Safe?